My name is Belinda Mather-Derrick and I’m part of the SME policy delivery team within the Crown Commercial Service. Over the last year, we’ve been working at all levels of government to bring forward some major changes to how we buy goods and services to make it easier for small businesses and the voluntary sector to win public sector contracts. The changes, along with new EU regulations that will make public procurement simpler came into force at the end of last month. We’ve been holding a series of roadshows over the past three months to talk about the changes and canvass your views. 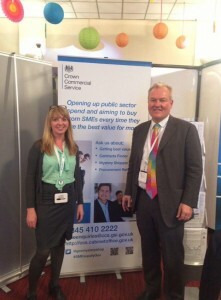 We attended events around the country and met over 2500 procurement people from central and local government and the wider public sector. It’s been great getting out there and hearing what the civil service has to say about these really important changes. So what are we trying to do? Well, as someone once said, it’s all about the economy! The public sector spends £187 billion each year, and the government wants competition in its marketplace from the best businesses in Britain, driving innovation which we know leads to better value for money for taxpayers, while helping businesses, small and large, to grow. The reforms are about changing the way we do things to make them easier for everyone, including civil servants. We’ve already removed bureaucratic Pre Qualification Questionnaires for low value public sector contracts within central government. The reforms recommended by Lord Young, the PM’s enterprise advisor, will push this out further into all public sector procurement. We’re also standardising the questionnaire for high value contracts; encouraging prompt payment (within 30 days) down the entire supply chain; breaking down large contracts into smaller ones that SMEs can confidently bid for; and making sure we have a central place where all public sector opportunities can be advertised. The roadshows have been a great way of helping people understand a potentially very complex policy, and how the changes will benefit them. People have been appreciative that we have made ourselves visible and have helped them understand what is going to happen and what they need to do to prepare. We talked about the new Contracts Finder website, which will be a world first - a “one public sector” online marketplace where it will be easier than ever before to find opportunities by price, location and sector and will benefit small businesses. Most people seem to think this is a very sensible thing to do. We talked to suppliers as well as buyers - one of the main concerns that small suppliers have when they consider doing business with government, is the often complex and overly bureaucratic processes they think they have to go through to even be considered. So they were also pleased to hear that things will get easier. We also highlighted the work that our Mystery Shopper Team do. Mystery Shopper allows suppliers to anonymously raise concerns about unfair public sector procurement practice so they can be investigated and resolved, and procurements made better as a result. This unique service is going to help us ensure that the new regulations make a real difference to the way we do business. The biggest benefit has been the face-to-face interaction and questioning we’ve received - it has given us a real feel for the issues involved and how we can make the policy work for both SMEs, and you, the buyers. We captured those views and concerns and have put together guidance based on much of what we learned from this one on one discussion. So we want to say thanks to everyone that came along. You’ve really helped. Don’t worry if you missed out and have questions though - we plan to bring more roadshows to you on a regular basis, as the most important thing we’ve learned from doing these, is that talking about what we do and bringing the human factor into policy is valued more than anything, and really brings it to life. Look out for us soon at a venue near you!